Concrete Renovations Ltd offers grit blasting for the preparation of concrete, stone and masonry; for the cleaning of steel reinforcement prior to repair. Abrasive blasting is the operation of forcibly propelling a stream of abrasive material against a surface under high pressure to smooth a rough surface, roughen a smooth surface, shape a surface, or remove surface contaminants. A pressurized fluid, typically air, or a centrifugal wheel is used to propel the blasting material (often called the media). The first abrasive blasting process was patented by Benjamin Chew Tilghman on 18 October 1870. There are several variants of the process, such as bead blasting, sand blasting, sodablasting, and shot blasting. One of the original pioneers of the wet abrasive (vapour matting) process was Norman Ashworth who found the advantages of using a wet process a strong alternative to sandblasting—which is banned in many countries. Common features include: the ability to use extremely fine or coarse media with densities ranging from plastic to steel, the ability to use hot water and soap to allow simultaneous degreasing and blasting, elimination of dust—so silicacious materials can be used without worry, hazardous material or waste can be removed without danger—e.g., removal of asbestos, radioactive, or other poisonous products from components and structures leading to effective decontamination. The process is available in all conventional formats including hand cabinets, walk-in booths, automated production machinery and total loss portable blasting units. Process speeds can be as fast as conventional dry sand blasting when using the equivalent size and type of media. However the presence of water between the media and the substrate being processed creates a lubricating cushion that can protect both the media and the surface from excess damage. This has the dual advantage of lowering media breakdown rates and preventing impregnation of foreign materials into the surface. Hence surfaces after wet blasting are extremely clean, there is no embedded secondary contamination from the media or from previous blasting processes, and there is no static cling of dust to the blasted surface. Subsequent coating or bonding operations are always better after wet blasting than dry blasting because of the cleanliness levels achieved. The lack of surface recontamination also allows the use of single equipment for multiple blasting operations—e.g., stainless steel and carbon (mild) steel items can be processed in the same equipment with the same media without problems. Bead blasting is the process of removing surface deposits by applying fine glass beads at a high pressure without damaging the surface. It is used to clean calcium deposits from pool tiles or any other surfaces, remove embedded fungus, and brighten grout colour. It is also used in auto body work to remove paint. In removing paint for auto body work, bead blasting is preferred over sand blasting, as sand blasting tends to invite rust formation under re-painted surfaces. In wheel blasting, a wheel uses centrifugal force to propel the abrasive against an object. It is typically categorized as an airless blasting operation because there is no propellant (gas or liquid) used. A wheel machine is a high-power, high-efficiency blasting operation with recyclable abrasive (typically steel or stainless steel shot, cut wire, grit, or similarly sized pellets). Specialized wheel blast machines propel plastic abrasive in a cryogenic chamber, and is usually used for deflashing plastic and rubber components. The size of the wheel blast machine, and the number and power of the wheels vary considerably depending on the parts to be blasted as well as on the expected result and efficiency. The first blast wheel was patented by Wheelabrator in 1932. 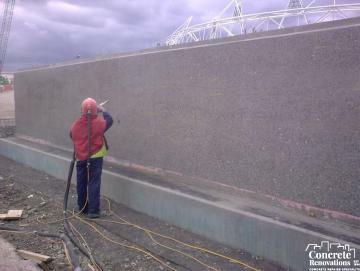 Hydro-blasting, commonly known as water blasting, is commonly used because it usually requires only one operator. 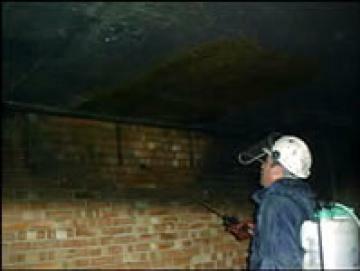 In hydro-blasting, a highly pressured stream of water is used to remove old paint, chemicals, or build up without damaging the original surface. This method is ideal for cleaning internal and external surfaces because the operator is generally able to send the stream of water into places that are difficult to reach using other methods. Another benefit of hydro-blasting is the ability to recapture and reuse the water, reducing waste and mitigating environmental impact. Micro-abrasive blasting is dry abrasive blasting process that uses small nozzles (typically 0.25 mm to 1.5 mm diameter) to deliver a fine stream of abrasive accurately to a small part or a small area on a larger part. Generally the area to be blasted is from about 1 mm2 to only a few cm2 at most. Also known as pencil blasting, the fine jet of abrasive is accurate enough to write directly on glass and delicate enough to cut a pattern in an eggshell. The abrasive media particle sizes range from 10 micrometres up to about 150 micrometres. Higher pressures are often required. The most common micro-abrasive blasting systems are commercial bench-mounted units consisting of a power supply and mixer, exhaust hood, nozzle, and gas supply. The nozzle can be hand-held or fixture mounted for automatic operation. Either the nozzle or part can be moved in automatic operation. Automated blasting is simply the automation of the abrasive blasting process. Automated blasting is frequently just a step in a larger automated procedure, usually involving other surface treatments such as preparation and coating applications. Care is often needed to isolate the blasting chamber from mechanical components that may be subject to dust fouling. In this type of blasting, air and dry ice are used. Surface contaminants are dislodged by the force of frozen carbon dioxide particles hitting at high velocity, and by slight shrinkage due to freezing which disrupts adhesion bonds. 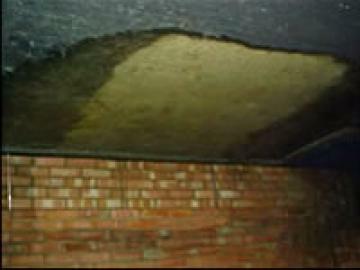 The dry ice sublimates, leaving no residue to clean up other than the removed material. Dry ice is a relatively soft material, so is less destructive to the underlying material than sandblasting. Bristle blasting, unlike other blasting methods, does not require a separate blast media. The surface is treated by a brush-like rotary tool made of dynamically tuned high-carbon steel wire bristles. Repeated contact with the sharp, rotating bristle tips results in localized impact, rebound, and crater formation, which simultaneously cleans and coarsens the surface. Mobile dry abrasive blast systems are typically powered by a diesel air compressor. The air compressor provides a large volume of high pressure air to a single or multiple "blast pots". Blast pots are pressurized, tank-like containers, filled with abrasive material, used to allow an adjustable amount of blasting grit into the main blasting line. The number of blast pots is dictated by the volume of air the compressor can provide. Fully equipped blast systems are often found mounted on semi-tractor trailers, offering high mobility and easy transport from site to site. Others are hopper-fed types making them lightweight and more mobile. In wet blasting, the abrasive is introduced into a pressurized stream of water or other liquid, creating a slurry. Wet blasting is often used in applications where the minimal dust generation is desired. Portable applications may or may not recycle the abrasive. A blast cabinet is essentially a closed loop system that allows the operator to blast the part and recycle the abrasive. It usually consists of four components; the containment (cabinet), the abrasive blasting system, the abrasive recycling system and the dust collection. The operator blasts the parts from the outside of the cabinet by placing his arms in gloves attached to glove holes on the cabinet, viewing the part through a view window, turning the blast on and off using a foot pedal or treadle. Automated blast cabinets are also used to process large quantities of the same component and may incorporate multiple blast nozzles and a part conveyance system. A siphon blast system (suction blast system) uses the compressed air to create vacuum in a chamber (known as the blast gun). The negative pressure pulls abrasive into the blast gun where the compressed air directs the abrasive through a blast nozzle. The abrasive mixture travels through a nozzle that directs the particles toward the surface or workpiece. Nozzles come in a variety of shapes, sizes, and materials. Tungsten carbide is the liner material most often used for mineral abrasives. Silicon carbide and boron carbide nozzles are more wear resistant and are often used with harder abrasives such as aluminium oxide. Inexpensive abrasive blasting systems and smaller cabinets use ceramic nozzles. In a pressure blast system, the abrasive is stored in the pressure vessel then sealed. The vessel is pressurized to the same pressure as the blast hose attached to the bottom of the pressure vessel. The abrasive is metered into the blast hose and conveyed by the compressed gas through the blast nozzle. Wet blast cabinets use a system that injects the abrasive/liquid slurry into a compressed gas stream. Wet blasting is typically used when the heat produced by friction in dry blasting would damage the part. A blast room is a larger version of a blast cabinet and the blast operator works inside the room. A blast room includes three of the four components of a blast cabinet: the containment structure, the abrasive blasting system and the dust collector. Most blast rooms have recycling systems ranging from manual sweeping and shovelling the abrasive back into the blast pot to full reclaim floors that convey the abrasive pneumatically or mechanically to a device that cleans the abrasive prior to recycling. In the early 1900s, it was assumed that sharp-edged grains provided the best performance, but this was later demonstrated not to be correct. Mineral: Silica sand can be used as a type of mineral abrasive. It tends to break up quickly, creating large quantities of dust, exposing the operator to the potential development of silicosis, a debilitating lung disease. To counter this hazard, silica sand for blasting is often coated with resins to control the dust. Using silica as an abrasive is not allowed in Germany, United Kingdom, Sweden, or Belgium for this reason. 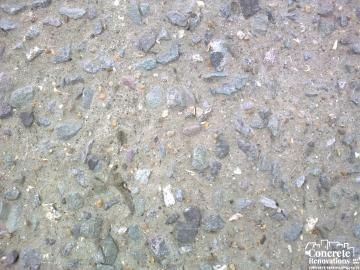 Silica is a common abrasive in countries where it is not banned. Another common mineral abrasive is garnet. Garnet is more expensive than silica sand, but if used correctly, will offer equivalent production rates while producing less dust and no safety hazards from ingesting the dust. Magnesium sulphate, or kieserite, is often used as an alternative to baking soda. Agricultural: Typically, crushed nut shells or fruit kernels. These soft abrasives are used to avoid damaging the underlying material such when cleaning brick or stone, removing graffiti, or the removal of coatings from printed circuit boards being repaired. Synthetic: This category includes corn starch, wheat starch, sodium bicarbonate, and dry ice. These "soft" abrasives are also used to avoid damaging the underlying material such when cleaning brick or stone, removing graffiti, or the removal of coatings from printed circuit boards being repaired. Sodablasting uses baking soda (sodium bicarbonate) which is extremely friable, the micro fragmentation on impact exploding away surface materials without damage to the substrate. Additional synthetic abrasives include process by-products (e.g., copper slag, nickel slag, and coal slag), engineered abrasives (e.g., aluminium oxide, silicon carbide or carborundum, glass beads, ceramic shot/grit), and recycled products (e.g., plastic abrasive, glass grit). Metallic: Steel shot, steel grit, stainless steel shot, cut wire, copper shot, aluminium shot, zinc shot. Many coarser media used in sandblasting often result in energy being given off as sparks or light on impact. The colours and size of the spark or glow varies significantly, with heavy bright orange sparks from steel shot blasting, to a faint blue glow (often invisible in sunlight or brightly lit work areas) from garnet abrasive. We also use a wide range of environmentally safe chemicals for cleaning and restoration using high pressure water and steam cleaning systems.